At giga-gume.si, you can order the sport touring radial tyres that you are looking for both quickly and conveniently. 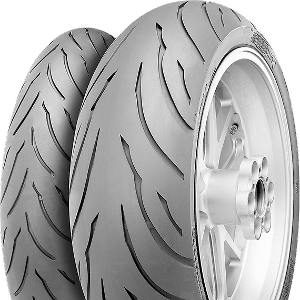 These quality motorcycle tyres have been manufactured by many top brands in order to keep you safe on the road. From Michelin Pilot to Michelin Pilot Activ wheels, you will be faced with a large number of offroad and supersport tyre choices for your moped or motorbike. Make sure that whatever wheels you end up choosing have been tailored to your bike. Of course, we offer an easy to navigate configurator that can help with making your selection. Stating the desired tyre size along with the speed index, brand and profile is all that you have to do to get started. Press “show tyres” and simply make your selection.